Mr. Resetti (real name Sonny Resetti) is a major recurring character in the Animal Crossing series. He is a mole with a yellow hardhat, blue overalls, and a pickaxe. In the Animal Crossing games, Mr. Resetti will appear if the player shuts off or resets the game without saving. Mr. Resetti will belittle and berate the player every time they do so, with his speeches become longer and irate with succeeding resets. He also has a brother named Don Resetti who substitutes for him on occasion. Mr. Resetti first appears as a trophy in Super Smash Bros. Melee promoting Animal Crossing. In Super Smash Bros. Brawl, Resetti appears as an Assist Trophy. 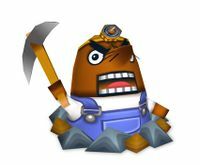 When summoned, Resetti will begin to give a speech chastising the players over not saving their game, sometimes even calling out the players on the stage or making impressions of them. His speech bubbles will block the top or bottom parts of the screen, depending on his position. Occasionally, Resetti might create a small explosion after being attacked. After his speech is done, Resetti will disappear. Although Mr. Resetti does not return as an Assist Trophy for Super Smash Bros. for Nintendo 3DS / Wii U, he appears as a trophy on the Nintendo 3DS version. In Super Smash Bros. Ultimate, he appears as a Spirit. Mr. Resetti also appears as an obstacle in the Animal Crossing course from Animal Crossing × Mario Kart 8 and Mario Kart 8 Deluxe. Future Release Prepare to receive a really long talking-to if you reset this game: the next time you play, Mr. Resetti will be waiting to deliver his best scolding. No matter what your intentions are, pressing the RESET Button will bring you face-to-face with this fervent character. Sometimes the only way to shut him up is to apologize. GCN Animal Crossing A mole wearing a hard hat who'll show up when you restart your game without having saved. He pops up and lets you know in no uncertain terms the importance of saving your game. The problem is, his speeches are entertaining enough to warrant breaking the rules at least once. In Animal Crossing, his brother Don appears too. He's the polar opposite of his sibling. GCN Animal Crossing A character who normally appears from underground to lecture the player. However, he is not always underground--in Animal Crossing: Wild World, he can be found sipping coffee at the Roost if you go at a certain time on a certain day. In the Japanese-only "e+" version, he works at a so-called "Resetti Observation Center" where you can pop in for a visit. This page was last edited on December 27, 2018, at 01:24.